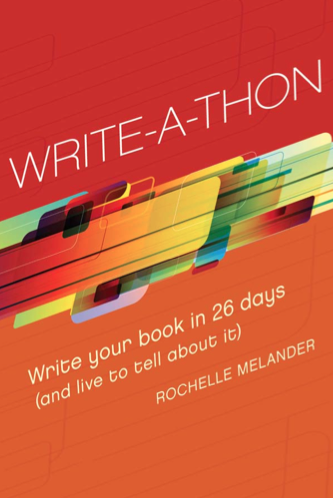 The following is an excerpt from Write-a-Thon: Write Your Book in 26 Days (And Live to Tell About It) by Rochelle Melander, now available from Writer’s Digest Books. Writers who want to pitch a TV series create a show bible. The bible contains the concept, location, bios of the characters, full episodes, synopses of potential episodes, and possibly even a pilot episode. Once the TV series is launched, the show bible is used to keep track of details about the setting and characters to preserve continuity. The show bible reminds writers about pertinent but minute facts. No doubt the writers for the TV show Buffy the Vampire Slayer needed to know the characteristics of each demon that Buffy fought as well as the names of her high school classmates who turned out to be vampires. It would be confusing if a student who was supposedly a vampire one season were suddenly able to see her reflection during the next season. As novelists, we can borrow the show bible tool and create a story bible for our project. Especially during National Novel Writing Month, the story bible can be a helpful tool for recording and remembering information. What color and model of car did our protagonist drive in chapter one? How did she take her coffee? And what was the name of that dead pet hamster she buried in chapter three? When we want the protagonist to get into her car, we don’t have to skim through one hundred pages of text to find out what kind of a car it was. We can turn to our story bible. During the editing process, the story bible helps us add depth and texture to the book. If we have collected pieces of dialogue, we can weave them into the narrative. If we have been gathering descriptive bits, we can drop those in to create mood. We can also use the story bible to check our book for continuity. What may seem like meaningless details to us—who cares if the protagonist takes her coffee black in the beginning of the book and with sugar at the end?—can annoy readers. A story bible can take many forms. Some writers prefer their story bible to be an electronic file on their computer. New services allow writers to store and share their work online, so they can access their story bible from any computer or wireless device. Writers can leave the story bible open while they work on their novel and fill it in as they write. Other writers like the feel and security of a physical story bible. A three-ring binder with pocket page dividers for each section works well for this. Writers can develop and add visual collages for their setting and character, mind maps of scene development, and ideas on sticky notes and index cards. The bible can be kept at the writer’s desk for easy reference and transported just about anywhere for brainstorming sessions. Another writer works with a long piece of butcher-block paper taped up along one wall of her office. On it she includes the time line for her books and index cards filled with specific characters and their traits. These visual tools allow the writer to have everything visible while writing. The writer doesn’t need to wonder if the protagonist has blue eyes or brown eyes. She can look up at the wall and see her character sketch. If none of these options seems quite right, feel free to combine them. While my story bible is in a three-ring binder, I also use an open document on my computer to jot down ideas and information while I am writing. That way, I stay focused on the story and continue writing while also honoring the ideas that are flying rapidly into my brain. You will find your own magic combination of electronic, print, and posted story bible. In software and systems, designers talk about the principle of good enough (POGE). According to the POGE, the quick-and-simple design is better than the more complicated or elaborate system. A quick-and-simple design can be released, used, and then upgraded based on the experience and needs of consumers. Apply the principle of good enough to your story bible. Creating the story bible should never become more important than writing your book. Create your story bible and plan your novel as quickly and simply as you can. As you work on your novel, you will adapt and expand the story bible according to your needs and not someone else’s idea of what your preparation should look like. Do what works for you. Rochelle Melander, the Write Now! Coach, is the author of 10 books, a certified professional coach, and a popular speaker. Melander teaches professionals how to write fast, get published, establish credibility, and navigate the new world of social media. Contact the author to speak by phone with your critique group, NaNoWriMo region, or book group. Love this idea. I’m just starting out and will remember this idea. It reminds me of the Customer Notes bible I used to use when working in customer services. Everything you need to know about a customer (story) is there in one place. Thanks for the idea. Never knew that customer service does a Customer Notes bible–sounds like a good idea. And a good reference point when creating your own story bible. Writers are obviously different. Some of us need the writer’s bible. Others would feel cramped and stifled by it. I’m in the latter group. Yes, I try to keep track of details about my characters, particularly descriptions of their physical self and characteristic habits, but the word ‘bible’ connotes control. When writing, I like to give over control to my subconscious and intuition. This variety in writing habits probably helps create the wide variety of books. It’s a good thing. I know what you mean. I use different tools for different books. For last year’s NaNo project, I wrote a series of kids’ books. My story Bible was a spiral notebook with a few notes in it. For other books, I’ve had much thicker tomes. Good luck with your project! This is a great idea! I never thought about it quite like this. I am going to check that out, too. I have been using paper, but I like the searchable feature in computer programs. No more madly searching through pages and pages of notes! Thank you! Mindmaps can be great and I have used them successfully in the past. I have started using an online system from http://www.plusmindset.com. Very simple and intuitive and allows you to search for anything you have ever recorded. It has become my personal writing center, place to save ideas and keep notes. Wow, thanks for the tips on software. Plusmindset is new to me. I usually go the low tech way–three ring binder and such. I will check this out. I like the searchable factor. Very cool to hear that you use a story bible in your work. I’ve found them amazingly helpful–though I tend toward low tech. I love mind mapping and will check out the mindjet software. Thanks! This is a great way to get a grasp on the issue of organizing background stuff. I hadn’t heard of the show Bible, but it totally makes sense. I’ve been feeling the need to better organize all my series info. This has hit the spot. Thanks again. I LOVE Scribner for my story bible. I even include pics of what the characters/homes/schools/settings look like in my head. Thanks for reminding me to be more vigilant in keeping my bible! Creating a Story Bible | H. J. Harding's Map to Wonder. I have used Treepad (treepad dot com) for many years and love it. Absolutely perfect for a story bible. The “Lite” free version is “good enough” for sure; but the bells and whistles of the paid versions are more than worth it.